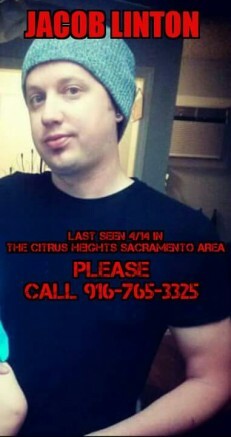 A former American River College student and father of one has been missing since the morning of April 14 and was last seen in the Citrus Heights area, according to his sister. Jacob Linton, 31, showed interest in going to see Los Angeles band Sister Crayon at Harlow’s on April 14, the same day he went missing. According to ARC’s public information officer Scott Crow, Linton attended the college from fall 2001 to fall 2007 and had no declared major. Linton, out of work since January, has been living in Citrus Heights with his his older sister Lesa Linton for about one month. He was supposed to check into probation for a DUI the day he went missing. Linton was told by his sister’s boyfriend that if he checked into probation and didn’t drink that he was welcome to stay there. Linton never came home. “He left here with just pants and a t-shirt on his back and his shoes, and his wallet and his phone and that was about it,” Lesa said. A missing persons report was filed with the Citrus Heights Police Department by Lesa on April 17. “Some sort of notification (was sent) to neighboring agencies,” Lesa said. Linton’s ex-girlfriend Claire Lopez moved to Hawaii with their two-year-old daughter, Arabella, last month because of a job offer. Lopez let Linton stay at her place the last “couple weeks” before she moved. “I wanted him to spend some time with Arabella,” Lopez said. Linton, who his sister said struggled with alcohol addiction, was missing once before, for “about a week,” after he was told to move out of his grandmother’s house in January according to Lesa. “We asked him to leave my grandmother’s house because he was drinking very heavily,” Lesa said. Ryan Houser, Linton’s friend, “has no idea” where he might be, but suggested his friend may have decided to leave town. Friends and family have reached out to the community for help. Rachel Delgado, a friend of Linton’s, posted yesterday on Facebook that the “past 11 days have been a nightmare” and urged everyone to “help in any way” they can. Lesa said she is not going to give up looking for her brother. Lesa urges anyone who has information on her brother’s whereabouts to contact her at 916-765-3325 or contact the Sacramento Sheriff’s Department. Be the first to comment on "Former ARC student missing"